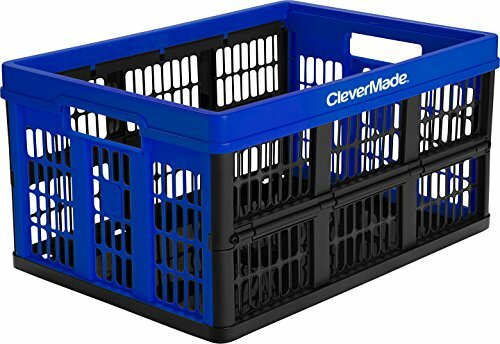 The CleverMade CleverCrates Collapsible Utility Crate is a smart, space-saving solution to simplify all of your activities, trips and day-to-day tasks. Pop 'em open when you need them, fold 'em flat when you don't. CleverCrates combines packing, transport and storage into one reusable, collapsible container. These all-purpose utility crates can also increase the ease and efficiency of daily tasks and storage, both indoors and out. Try them out for wholesale club shopping, storing sporting equipment, arts and crafts, organizing kids' toys, home improvement projects, and laundry. Measuring 20.9" L x 14.6" W x 10.6" H, it holds 45 liters (47.5 quarts) by volume, with a maximum load capacity of 66 pounds. It features a sturdy bottom base with open air grated walls, so you can easily view the contents. Comfortable, side grip handles make heavy lifting a breeze. The interlocking nesting system provides stability for vertical stacking. When not in use, it collapses down to 2.4" H for compact storage and weighs 2.8 pounds. CleverCrates are made of recyclable materials, offering a sustainable alternative to plastic and paper bags, totes, and boxes. CleverCrates are easy to clean, simply hose off or wipe out with a wet cloth. They can even be sanitized in the dishwasher. If you have any questions about this product by CleverMade, contact us by completing and submitting the form below. If you are looking for a specif part number, please include it with your message.